The Vactor 2100 Series combines power and reliability. This series of sewer cleaners unites power and reliability with customer-configurable design to handle any cleaning job with speed, and thoroughness. Cleaning the sewers is a job that no one wants to have, which is why machines were built to take care of such messy business. Goscor Cleaning Equipment provides the highest quality combination jetting machines on the market to get this dirty work done quickly and efficiently. These sturdy, powerful, and reliable machines have been designed for cleaning wastewater and sanitary systems in a number of applications. Whether you’re a professional contractor or dealing with public utilities, the exclusive combination jetting machine models from Vector will help you get the job done right. The Vector Centrifugal Compressor Sewer Cleaner series was designed to merge power and reliability with customization, giving users the ability to easily configure its design to suit any cleaning job with thoroughness and accurate speed. It’s most powerful features are the innovative telescoping hose and boom. The hose rotates and together they create one of the most efficient systems on the market. 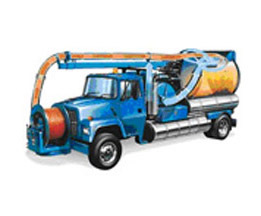 The Vector Positive Displacement Sewer Cleaner takes the power, reliability, and customization from the Centrifugal machine, along with the boom and hose reel features and adds a different system of integrated components. This combination jetting machine provides the only pump on the market that is specifically designed for cleaning out sewer lines. Each model in the Vector series of combination jetting machines is built with features and qualities that make them the best in the industry today. No matter what your cleaning needs are, turn to Goscor to find the perfect piece of equipment to meet them. For over 31 years, Goscor has been on a mission to provide the very best industrial equipment products and solutions on the market. They deal with some of the leading brands in the world to ensure that every customer receives equipment that will last a lifetime. To take their commitments even further, they provide world class service by highly professional, factory trained technicians who understand every customer’s needs and expectations. Leave the heavy work to a name you can trust – Goscor.